You need to find some common groove ground between your two loops, without completely losing the vibe of either. Groove is a funny old thing. Everybody sort of knows what it is, but explaining it isn't easy. The term comes from the grooves of a vinyl record, but the connection is more meaningful than that. A groove is when a band or group of different instrument parts fall into a cohesive rhythm - like a stylus sliding into the circular grooves of a record, musical parts are locked into a matching and complementary cycle. Of course, what constitutes a good groove is subjective, and often people only use the terms 'groovy' and 'groove' about music they actually like… but really, the factors at work are very similar - it's just the amount (or absence) of these factors that people are squabbling about. So what kinds of things are we talking about? Put simply, we can say that groove is largely concerned with the timing and emphasis (velocity) of individual notes and percussive hits, and, importantly, the interaction between different musical parts and sounds. In this sense, 'groove' is heavily related to 'swing', but where swing usually specifically refers to the nudging of offbeat notes off strict quantise placements, groove takes in a range of factors, of which swing is just one - albeit a critical one! When bands play live, all of these things are important, and the difference between a 'tight' live band and a less skilled one is the ability to lock into the same groove. The styles of groove vary massively from genre to genre, too, which is why skilled session musicians are so prized, as they're able to move seamlessly from one style of groove to another, whereas even a skilled player in a rock band, for example, might struggle to play convincing reggae parts. As with many aspects of 'real' music, recreating the effect of bands playing together can be tricky, but there are a number of simple ways to achieve close approximations. Perhaps even more tricky, though, is combining such live-style grooves with electronic programmed beats, especially with music typically designed around rigidly programmed drums such as dance music, pop and even modern breakbeat. Fortunately, there are a few key tricks involved in this, too. We're largely looking at percussion here, but the same principles apply for musical parts as well. And as you begin analysing grooves to match them to your tracks, you'll quickly notice patterns emerging between different styles. These are the trademark 'grooves' for those styles, and you'll soon be able to recreate the feel of these genres at will! For more advice on achieving organic sounding mixdowns, get your mitts on Computer Music 224, which is on sale now. Step 1: Let's see how to add live-played percussion to a conventional house beat. We don't want to lose the live feel, but we still want to lock both into a groove. 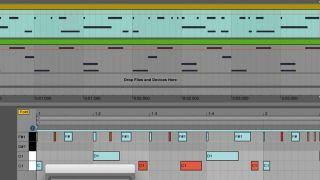 Start by loading Live Drums.mid (recorded via Roland V-Drums) onto a MIDI instrument track hosting a sampled acoustic drum kit (most DAWs include one), and House Drums.mid onto a track with Grooove CM's 909 kit. Step 2: Playing both parts together, the first thing we notice is that they clash. None of the live hits are perfectly quantised, and the 909 part has swing applied, so it's not rigidly quantised either - but it's at least consistent. Apply rigid 1/16 quantisation to both, and they come together perfectly but lose all the funk and swing. Not quite what we want! Step 3: We need to find some common groove ground between the two loops, without completely losing the vibe of either. We start by highlighting the live hits that clash with rigidly quantised positions in the 909 loop - kicks and snares are the prime offenders - and quantise them to match the house loop. Playing things back yields a much tighter loop. It's becoming a solid groove. Step 4: The live hats sound funky played alone but a little lazy in comparison to our dance groove, and they reduce its energy and drive a little. One way to match the two would be to use groove mapping, but instead, we'll highlight all of our live hi-hat parts and pull the notes forward so they hit slightly earlier, imparting a sense of energy and urgency. Step 5: We're almost there, but the feel of the two loops is still a little different. This is because the 909 beat has an accent highlighting the offbeat hat between the kicks, whereas the live-played loop emphasises hits on the beats. We carefully go through and modify the live MIDI note velocities so that they emphasise the live offbeat hats to match the bounce of the 909 rhythm. Step 6: We finish up by looking for any remaining clashing hits - for example, some of our live-played hats still clash a little with some of the swing-quantised 909 hats. To keep the feel but lessen the clashing effect, we can make small manual adjustments to the live percussive hits, or simply lower the velocities of the clashing live hits. Locking your beats in this way makes for tight and groovy mixdowns.